New varieties of watercress with improved cancer-fighting ability developed by the University of Southampton will feature at this year’s RHS Chelsea Flower Show (23-27 May 2017). For the past decade or so, scientists at Southampton led by Professor Gail Taylor, Professor of Plant and Environmental Biology, have captured the natural genetic variation that exists across the globe, identifying new ‘wild watercress’. Some of these wild varieties will be featured in the garden ‘Mighty Greens’ presented by Hampshire’s Sparsholt College at Chelsea. 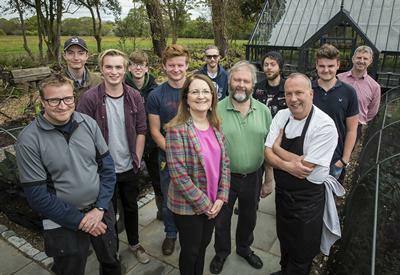 Chef Luke Matthews of Chewton Glen in the New Forest has worked with this new material to produce a salad that plays on the sweeter taste of this wild watercress. The Mighty Greens garden showcases a range of edible plants used in salad mixtures, together with the development of watercress from traditional Victorian street snack to the cutting edge work of the University in cancer prevention. These wild varieties provided the starting point for a new breeding programme that was initiated in 2007 at the University of Southampton. This is the only breeding programme for watercress, worldwide and has involved unravelling the complex nature of the watercress genome at the level of DNA, so that markers can be identified and used in future breeding, without any necessity for GM. Currently more than 200 unique varieties are in development and 80% of those tested show more than a 30% increase in cancer fighting potential. As a result, this research is delivering new and novel watercress for the commercial market in collaboration with Vitacress Salads and Steve’s Leaves. “Of all of the leafy crops, watercress is the most nutrient dense, packed with vitamin C, iron and calcium –beating both spinach and kale,” says PhD student Nikol Voutsina who is involved in this research. “The ability of watercress to fight cancer has been proven through scientific studies showing that the presence of phenethylisothiocyanate (PEITC), a naturally occurring plant chemical can have inhibitory effects on multiple cancer hallmarks.